He's not mine! Shouldn't be yours either! "Oh cool! A pet wolf! How awesome!" Yeah, that is until he decides he's alpha, or gets hungry around the neighborhood cat, or he simply has a disagreement with you or your kids. Then he reminds you exactly what he is. A wild animal that belongs in the wild only. Sadly, then it's the wolf that suffers, not the humans who forced him where he doesn't belong. So what's with the wolf? Simple. He's not mine. 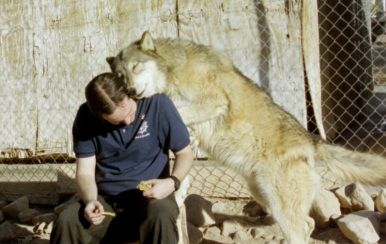 This image was taken at Wolf Mountain Sanctuary. 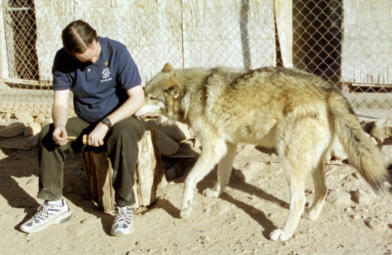 It's a wolf sanctuary in Lucerne Valley California that rescues wolves from breeders, people who foolishly think it'd be cool to own a wolf, and other similar situations. 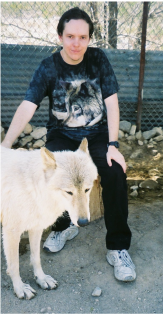 At this sanctuary, you can go in and interact with the wolves directly. You can touch them, be around them, and get to appreciate everything about the wolf. All under the careful eye of Tonya Littlewolf, the owner who, last I knew, has not had an incident since it opened in 1987. Listen to what she tells you, and you will get to have the same experience. Some compare it to swimming with dolphins. Having never done that, I couldn't say, but it was an awesome experience. Especially one trip where one wolf, Istas, got close. "Wait, you just said they were wild animals." They are. This was a wild wolf scent marking me. You notice I was letting him do what he wants here. I was a guest in his and Tonya's territory. He wanted to rub against me, and he got to do it. It's not a threatening or dangerous behavior. If anything it could be considered an honor. As I under stand it, Istas was actually marking me as a member of his pack. "Uhm, there's a lot of past tense there." Yes. Sadly Istas is no longer with us. He died in 2013, and I'll miss him dearly. 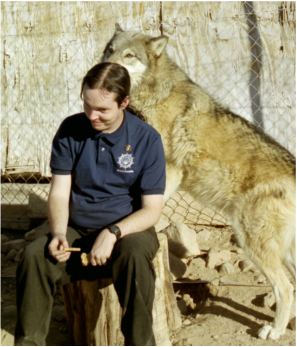 He was the first wolf I ever got THAT up close and personal with. I truly believe he and I shared a connection, which he showed by his rubbing. Why it took about five minutes to properly scent mark me, well, you'd have to ask him. Go here to visit their website and find out more.